Like tweed but a lot lighter and softer – a brand new cloth, made entirely in Britain, from 100% Scottish Merino wool. Not many people know that, although the finest cloth in the world is still woven in the long established mills of West Yorkshire, British wool plays no role in this: 100% of the Merino fibre used in this coveted fabric is imported from across the globe – from Australia, New Zealand or, increasingly, from China. The coveted Merino breed originates in Europe, where it was first kept by the kings of Spain. Later, they were also kept in Saxony and Britain, before Australia and New Zealand were discovered for their vast pastures and mild climate in the late 1800s, and the tradition ended. Ever since, Merino wool has been imported to the UK from the far side of the globe, to be woven into the fine cloth the British woollen industry is famous for. To find a more sustainable source for the wool, the British government conducted research into the re-introduction of the Merino breed in the UK. 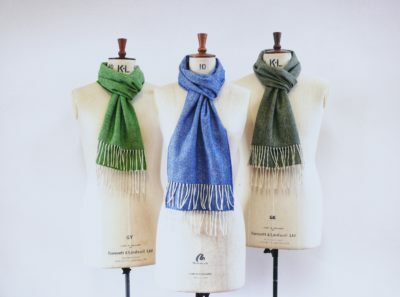 The breed that was successfully developed for this research is a mix of 75% Saxon Merino and 25% Shetland, making it hardy for the Scottish climate. Although successful, the project was abandoned before the wool was put to use in a product, when funding dried up. Importing wool from overseas is hurting not just UK sheep farmers, whose fleeces fetch only a relative pittance, but the British wool industry as a whole. Scouring, carding, spinning – processes the Northern mills invented and refined over decades – are now being carried out ‘on the way’, in low labour cost countries on the shipping route. Mills in the heartlands of the British textile industry are closing down as a result. The Scottish Merino sheep still exist. It took me the best part of 18 months to build a relationship with the five individual growers who keep the descendants of the original flock of Scottish Merinos in the Borders region. Their wool has been graded at the highest fineness level available (141), certified by the British Wool Marketing Board and can easily compete with fleece imported from overseas. The first fine suiting cloth with a 100% British production chain. R. Gledhill Ltd., spinners of fine woollen yarns for over 80 years, located in Delph, on the Yorkshire border, embraced the project and oversaw the processing of the precious wool, from scouring to finishing. I took delivery of the first bolt last week and can say the cloth has exceeded expectations in terms of fineness, softness and drape. It really is in a class of its own. Weighing in at just under 12oz, and being incredibly soft to the touch, the new cloth is a perfect all-year suiting material. The scarves will delight you with their soft drape and beautiful colours.